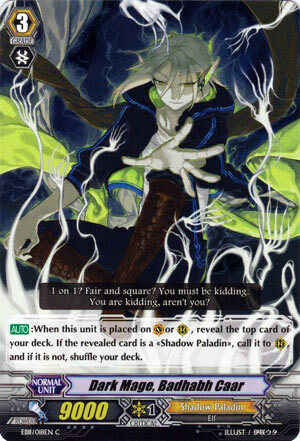 [AUTO]:When this unit is placed on (VC) or (RC), reveal the top card of your deck. If the revealed card is a «Shadow Paladin», call it to (RC), and if it is not, shuffle your deck. Would have been absolute crap were it not for the fact old Blaster Javelin could translate one of these into the bulkier PBD. Not that PBD was MUCH better but an 11k body was already putting itself a leg up over this crap.